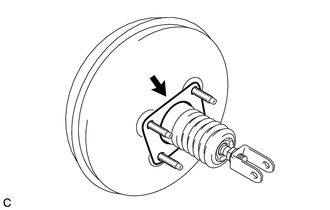 Release the vacuum from the booster by depressing the brake pedal several times. Then remove the brake master cylinder from the brake booster. (a) Slide the clip and disconnect the vacuum hose from the brake booster assembly. (b) Remove the 2 nuts and separate the No. 1 vacuum hose connector. 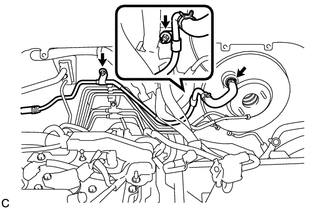 (a) Remove the clip and push rod pin. 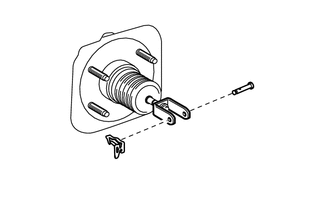 (a) Remove the 4 nuts and brake booster assembly from the body. Do not damage the brake lines. (a) Remove the brake booster gasket from the brake booster assembly. 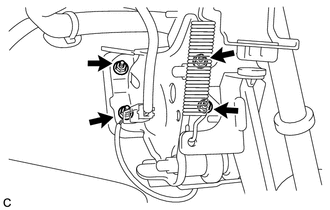 (a) Loosen the lock nut, and remove the brake master cylinder push rod clevis and lock nut. (a) Remove the brake vacuum check valve assembly from the brake booster assembly. 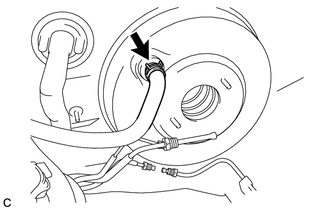 (a) Remove the check valve grommet from the brake booster assembly.